This week is all about LOVE! I heart Valentine's Day in the classroom! I love seeing my little munchkins pass out their cards to each other. I remember how important it was as a child to find the perfect set of cards and pick out just the right one for each person. :) We'll be doing this fun activity again tomorrow. I found it on Pinterest last year and it was a BIG hit! 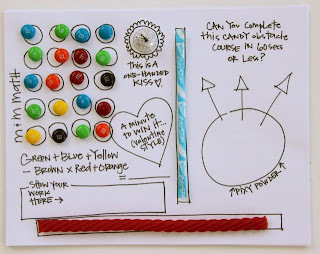 Minute-to-Win-It Valentine's Day Obstacle Course. Click the pic to go to the source and grab it! 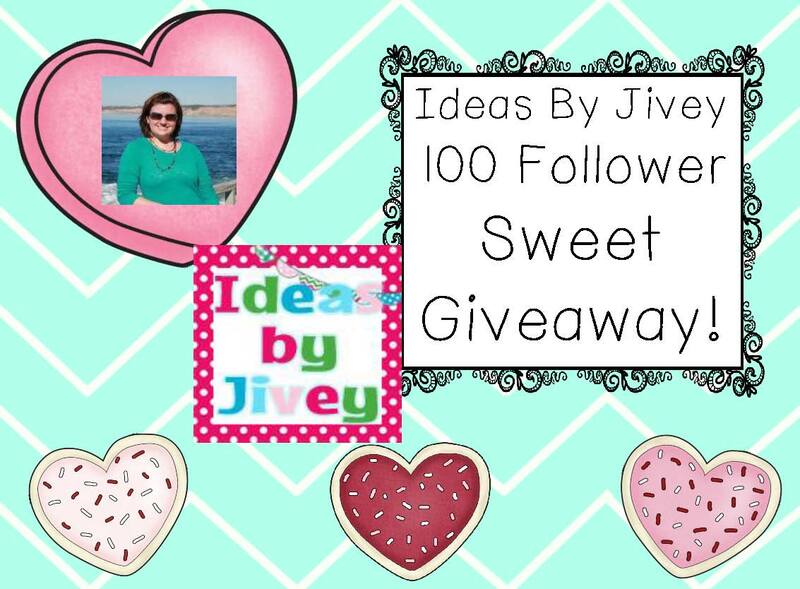 And, because it's the week of love, I have a blog to showcase that you will LOVE and she's having a 100 Follower Giveaway right now!! It ends tomorrow, so head on over right NOW and join in the fun! You're going to L-O-V-E Jivey!! Hi! I'm Jessica Ivey, or affectionately known as Jivey. Apparently, Jessica was a very popular name when I was born because so many of my friends are named Jessica!! So, they shortened my name (like J-Lo!) to Jivey. It totally stuck, and when I get married, I'm going to have a hard time letting it go. Ha! 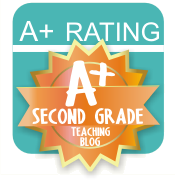 Grade You Teach: I teach 4th grade this year. It's my second year in 4th. I also taught 3rd grade for two years, 1st grade for two years, and 2nd grade for one year. I didn't necessarily switch willingly every time as we had a principal who liked to "toss things up," but I LOVE having the experience in other grades, and being aware of what they should be coming to me ALREADY knowing. It's hard to pick a favorite grade honestly. I love the kiddos' maturity and independence in 4th, but I sure did LOVE seeing the growth they made in reading in 1st grade. What is your favorite subject to teach? I absolutely adore Language Arts and Social Studies. Ironically, when I was in school, I HATED Social Studies. I think my teachers just didn't make it fun, so I dreaded having to memorize names and dates and battles and wars I cared nothing about. I think I love teaching it so much because I keep that in my mind- I make it as fun as I can and try to connect meaning to everything they need to know! What would we likely see if we popped into your classroom unannounced? You'd see kids all around the room and you'd have to find me sprinkled in there! I am constantly having my kiddos working in partners or groups and I just mingle in and out of what they are doing. What is one “can’t live without” teaching resource? I love my kiddos' Social Studies Interactive Notebooks! I honestly don't think they would "get" what they get this year without them! One thing we do in them is read together a passage on the topic we are learning about and they decide what's important from the text- instead of writing notes about it, they draw pictures to represent those key facts and label them with short words and phrases that help them remember their importance. It really helps my ESOL students as well as my below-level readers, because we all know they aren't going back to re-read those passages at night!! What is one of your blogging goals for this year? 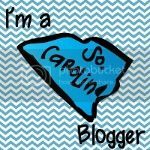 Well, since I just started blogging in January, I'd say my biggest goal is to meet more bloggy friends! 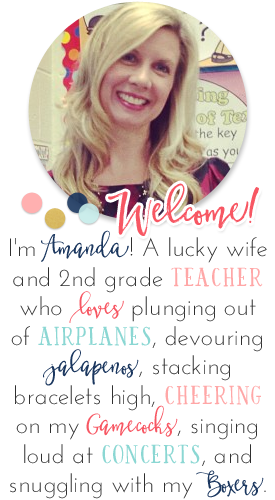 I've already made a few, and it has definitely improved me as a teacher! I love getting ideas from others as well as sharing them! Great blog to showcase! 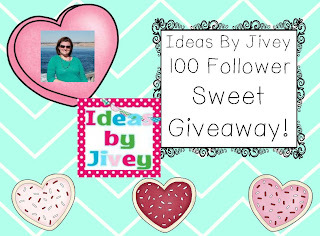 Jivey is funny and her blog is adorable plus she has great ideas! The kiddos love the minute to win it! Thank you for posting the link! I couldn't remember where I got it! Sundays in the South: It's Been a While! Pop! In to Win a Game and a Book! Friday Flashback Linky: Football Frenzy!